Activision has just announced a shocker of a deal for Guitar Hero fans. If you preorder Guitar Hero 5 or you purchase the game in specially marked boxes in September - you'll get yourself a free copy of Guitar Hero Van Halen for free! Guitar Hero 5 is scheduled for a September 1st release, while Guitar Hero Van Halen is schedule for a late fall release. That'll net you a total of 130 songs for the price of one game. It's unclear though whether or not you'll need to purchase the GH5 pack with the guitar, which is pictured above, or if the stand alone version will do. This is a mail in offer and they do say "allow six weeks for delivery" - but it appears you'll be Hot For Teacher before anyone else is! Guitar Hero® is offering fans across the US an unheard of limited time bonus offer. With every purchase of specially marked copies of Guitar Hero® 5 during the month of September, living room legends will be able to rock out with an advance copy of the unreleased Guitar Hero® Van Halen® (up to a $60 MSRP value), long before it takes the stage in stores. Rock out to over 130 on-disc tracks in two games on September 1 by pre-ordering Guitar Hero 5 now at your local retailer or at http://gh5.guitarhero.com/preorder.php and picking up your copy in September, or by buying specially marked copies of the game at any retailer anytime during the month of September, and take advantage of this limited time offer. 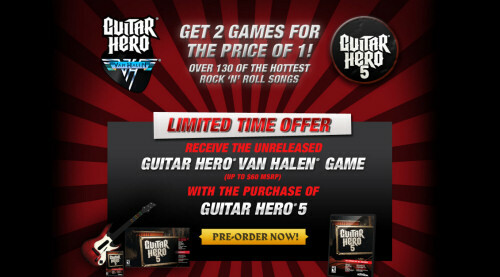 Please visit www.guitarhero.com/vanhalengameoffer for full offer and redemption details. On September 1, living room legends will rock any way they want in Guitar Hero 5. The entire set list is at players’ finger tips from the start, featuring genre-defining hits from more than 80 of the biggest rock artists and bands of all time, including The Rolling Stones, The White Stripes, Kings of Leon, Tom Petty, Bob Dylan and Vampire Weekend, plus more than 25 artists from a variety of music genres that will be making their music video game debut. Players take complete control as Guitar Hero 5 allows gamers to personalize and customize how they experience music by being able to play with any in-game instrument combination -- multiple vocalists, guitarists, bassists and drummers, in any game mode. With the game’s all-new Party Play Mode, getting the band back together has never been easier. Players can now jump in or drop out of gameplay seamlessly, without interrupting their jam session. Elevating theGuitar Hero® series to new heights with unmatched social gameplay, an enhanced style, new in-game artists and more rock legends, Guitar Hero 5 features new surprises and challenges that will fire up long-time fret board fanatics and create a new generation of addicts. Guitar Hero 5 is rated “T” (Teen – Mild Lyrics, Mild Suggestive Themes) by the ESRB and will be released for the Xbox 360, Nintendo Wii, PLAYSTATION 3 and PlayStation 2. For more information about Guitar Hero 5, please visitgh5.guitarhero.com. Guitar Hero Van Halen is rated “T” (Teen – Mild Lyrics, Mild Suggestive Themes) by the ESRB and will be released for the Xbox 360, Nintendo Wii, PLAYSTATION 3 and PlayStation 2. For more information about Guitar Hero Van Halen, please visit www.vanhalen.guitarhero.com. Page created in 0.3946 seconds.